Dry skin is often due to environmental factors, such as harsh winds, excessive sun or central heating but can also be caused by fluctuation in hormones (common in adolescence), sensitivity to particular cosmetic products or even just plain old genetics. Dry skin is often characterised by sore red patches, visible lines and flaking skin. It is very common for those with dry skin to also experience oily breakouts too. This is due to your skin producing excessive amounts of sebum to attempt to counteract the dryness. Remember there is a distinct difference between dry and dehydrated skin. Dehydrated skin may look normal, but feel tight and look dull, and is usually a result of poor diet. There are two things you must do for dry skin – exfoliate and moisturise. Below is my advice on the two, however, while the below may help, you must be sure that your dry skin is not a side effect of any medication you’re taking or other cosmetic product. If you’re not taking medication but use other cosmetics, try limiting yourself to just washing and moisturising for a week or two, to see if there are any improvements. As above, there are also many external factors such as heating and weather. If you notice your skin improves during the warmer months, it could be you need to adjust your skincare routine for the winter months. Exfoliate – the number one thing you can do for dry skin is exfoliate. Exfoliating using a gentle scrub helps to remove the top layer of dead skin cells, and reveal the new layer underneath. You must do this sparingly, however, and no more often than once a week. If you exfoliate too often, you will strip the skin of moisture and ultimately make the problem worse. 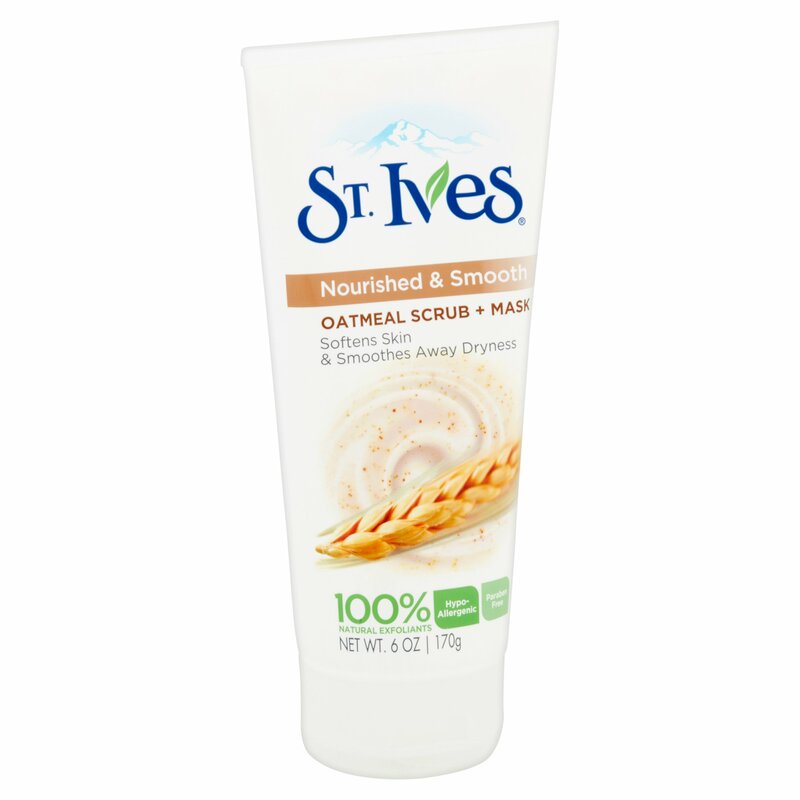 You must also avoid harsh exfoliators such as St Ives Apricot Scrub. Scrubs where the micro-beads are non-dissolvable or made from sand or kernel can create micro-tears in your skin as you wash, ultimately leaving the skin sore and flaky. Plastic micro-beads are also not environmentally friendly. What I recommend – You do not necessarily need to purchase an abrasive exfoliator, a damp face cloth rubbed in a circular motion over dry areas should do the trick, particularly after a shower when your pores are more open. This is a particularly good face scrub for three reasons. 1. It uses completely natural exfoliants and is very gentle, particularly for dry skin that is sensitive. 2. It is nourishing and moisturising as a mask – just leave it on for a few minutes after applying. After removing any makeup or skin products, splash your face with warm water to open pores. Apply a small amount of the scrub to your whole face in small circular motions, focusing on the driest areas – i.e. sides of your nose/t-zone. * I never used to understand the importance of patting your skin dry, but as it turns out, rubbing your face with a towel after washing not only aggravates your skin, but will lift up any dry skin making it more obvious to the naked eye. Once your face is dry, move on to the next step – moisturising. Moisturising your skin is sometimes seen as a step to skip. It is very important, whatever your skin type, as it restores the balance and keeps your skin from getting too dry or too oily. When you have very dry skin, I recommend you use a combination of both daytime and nighttime moisturisers. Daytime moisturisers are light and absorb quickly, whereas nighttime moisturisers are usually heavier and often feel a little greasy, designed to absorb overnight, rather than in a few minutes. Personally, my favourite moisturisers for dry skin are by Nivea. I use the Express Hydration Primer – Superdrug £5.25, as mentioned in my previous blog post, and the Nivea Regenerating Night Cream – Superdrug £4.19 is perfect for dry skin. After cleansing in the evening, apply a small amount of the Regenerating Night Cream in small circular motions all over your face. Leave overnight and cleanse in the morning. After cleansing in the morning, apply a small amount of the Express Hydration Primer to your skin, from your forehead down to your chin. When applying make-up, choose products that are suited to your skin type. For dry skin, a tinted moisturiser may work better for you than a full coverage foundation. Avoid powders as these can cling to flaky skin, emphasising the dryness. Apply foundation from your forehead downwards, preferably using a beauty blender, patting down. While you should always apply foundation down your face and not upwards or in circles to avoid getting it underneath the vellus hairs on your face, the same applies to dry skin. Patting it downwards stops the build up of product underneath flaky skin, leaving a smooth finish. Use cream blush, again in downward strokes, and spritz with a finishing spray to hold everything in place. I actually recommend B. Confident Hyaluronic Acid Facial Spritz – Superdrug £7.99 for spraying dry skin after applying makeup. This spray is ideal for chucking in your handbag to refresh your face throughout the day, and also – if you decide to use powder – stops your face from looking too powdery. I will say I do not recommend it for sensitive skin, as it genuinely contains Hyaluronic Acid, which although moisturising can cause issues with sensitivity. While maintaining a nourishing, moisturising skincare routine, make sure that you are eating plenty of fruits and vegetables and drinking enough water. While skincare products can help relieve symptoms of dry skin, a healthy diet can actually improve dry skin from the source – you! Eating healthily not only improves your overall health and clarity of your complexion, but can help to balance out hormones and drinking plenty of water helps your liver flush out toxins. If you live in the north or experience cold, dark winters like we do here in Britain, I also recommend you take a Vitamin D supplement, as we usually absorb this from the sun’s radiation and it can affect our skin if we don’t get enough. Please consult a doctor before taking Vitamin D supplements. When it comes to any particular skin type, it is important to remember that there is no quick fix. You may have to trial several products before you find the one that’s right for you, and this can be a long and disheartening process. But you must stick to it, because it is so worth it once you finally find the regime and products that work for you. I have chosen to suggest drugstore brands as I feel they will be more readily available and affordable for my readers. If you have used a more high end product that has worked really well, please recommend it in the comments! You can find out more about other skin types by visiting the Directory. The directory will be complete by the 28/01/2018. I have not been sponsored to promote any of the products within this post. It is important to note that this post is ADVICE ONLY and if choosing to take supplements or make drastic changes to your diet I strongly advise you consult a doctor.